The United States Mint has provided more specific details for the release of the 2011 America the Beautiful Silver Bullion Coins. When the 5 ounce silver bullion coin series debuted late last year, they generated a great deal of attention due to the extremely low mintages and special terms and conditions imposed on the primary distributors. Each of the five designs issued for 2010 carried a mintage of 33,000 for the bullion version of the coin, compared to the initially anticipated mintage level of 100,000 per design. All five designs were released at the same time in early December. In order to participate in the distribution of the coins, authorized purchasers were required to agree to a special set of terms and conditions, which included distributing the coins directly to the public, imposing a household limit of one coin per design, and limiting premiums to 10% above acquisition cost. The US Mint will release the first two designs of this year featuring Gettysburg National Military Park and Glacier National Park on April 25, 2011. Because the mintages will be substantially higher than the previous year, authorized purchasers will not be subject to additional terms and conditions on the 2011-dated coins. They will, however, be required to certify that they have distributed all of their 2010-dated coins in accordance with the applicable terms. 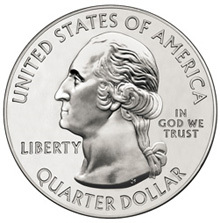 As with the prior year, the US Mint is imposing a premium of $9.75 per coin above the market value of the silver content for authorized purchasers. This group of eleven primary distributors is able to purchase bullion coins directly from the United States Mint. The bullion coins are then resold to other bullion dealers, coin dealers, and the public. I have no interest in participating in this since the dealer (APMEX) has never released the promised coins and has played coy with all inquiries as to price and availability. I have been on their “watch” list for months. Meanwhile the coins are all over Ebay, etc. Forget it! Pretty clear the first 5 will be the ones to own to make the set. The prices really will make these not bullion. The mark up on these two coins will justify the raw prices on the first 5 given that they are a bit more scarce.